The Stadium’s new production of Footloose the Musical will transport audiences back to the glory of the 1980s from November 3 through 5. Footloose is about a spirited teenager named Ren who leads a rebellion in a small farm town after the town elders ban dancing and rock music. 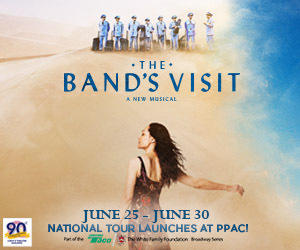 The musical has all the hits from the movie, including “Let’s Hear It for the Boy,” “Almost Paradise” and the title track, as well as some new songs. “All the characters are the same and we are going with the theme of the (movie) for our show,” explained director/choreographer Emily Garven. Garven said the production has had its share of challenges. The original director dropped out at the last minute due to health issues, so Garven had to step in. One of the lead actors also left just a month before production began. Some of the teenaged members of the cast also had a little difficulty adjusting to the attitudes of 1980s teens. However, Garven said they are now falling into the time period without any problems. Garven does choreography for a performing group called Inspiration, which appears all over the country. She directed Willy Wonka and the Chocolate Factory last year at the Stadium.